The analysis of the pottery from our first season is underway and you can look forward to an exciting new feature, ‘Favourite sherd of the day’. Below is today’s. 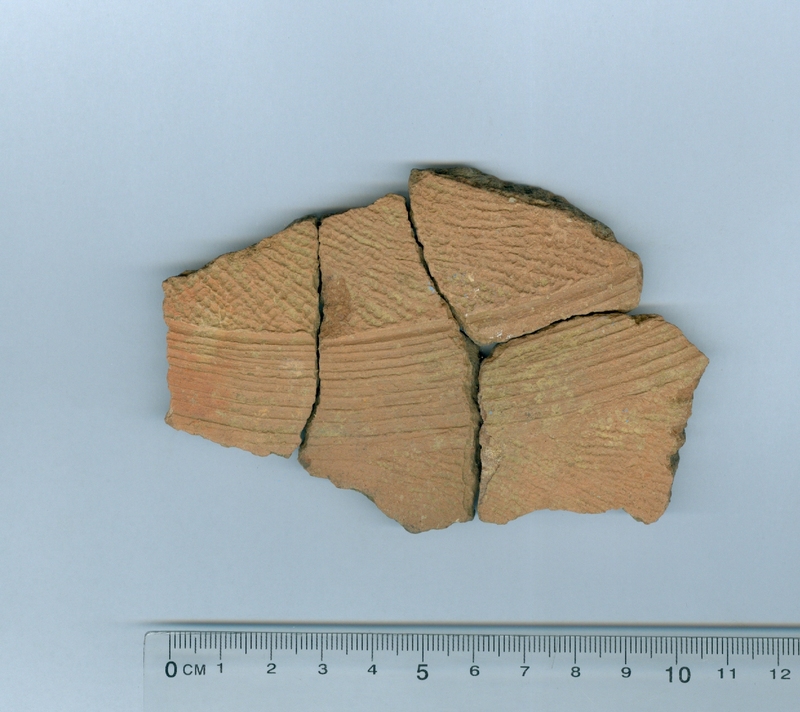 This sherd is made of four fragments; the breaks are old, so they occurred at some time before or during deposition, rather than post-excavation (e.g. on the plane over to the lab). For analysis purposes they will therefore be treated as four individual sherds, although I’ll make a note that they all in fact used to be part of the same pot (MNI=1). In terms of decoration, a couple of things are happening here. Someone used a very fine twisted string roulette – one of the finest I’ve ever come across – to make the pattern of sinuous lines which you can see at top and bottom. Then they smoothed a band about 2 cm wide across that roulettes surface and ran some kind of ‘comb’ across it – something with quite wide teeth and few gaps in between, so maybe a collection of flat-sectioned grasses, say. They also made a deeper groove at the top of this band (I say top, but of course orientation is guesswork – it could just as well be the bottom) – probably with a stick. The inside surface is fairly well smoothed but has been left rather unfinished. The thickness of the sherd varies. All in all not a manically precise job there. However, the firing was very evenly done – the dark core at the centre, which is the part which has not completely oxidised – is even in thickness and spread (as far as I can tell – difficult without a fresh break). Also, the clay was quite finely sorted, featuring small mineral inclusions of pretty consistent size. So either the local clay was already nice and clean or, mroe likely, the potter spent some time soaking it and picking out large inclusions, roots etc. This sherd was excavated at around 100cm depth in Test pit 1 at site BLaf. Once the rest of the assemblage has been studied, and once the radiocarbon dates are back, we will have a first clue regarding the a possible age of this level and thus indirectly of this sherd. This is always a process of estimates, though, with margins of error at each stage. More on this anon. This blog has been set up to chart the activities and research findings of two projects led by Anne Haour, an archaeologist from the Sainsbury Research Unit at the University of East Anglia, United Kingdom. The first project, called Crossroads, brings together a team of archaeologists, historians and anthropologists studying the Niger Valley where it borders Niger and Bénin (West Africa). We are hoping to shed more light on the people that inhabited the area in the past 1500 years and to understand how population movements and craft techniques shaped the area's past. The second project, called Cowries, examines the money cowrie, a shell which served as currency, ritual object and ornament across the world for millennia, and in medieval times most especially in the Maldive Islands of the Indian Ocean and the Sahelian regions of West Africa. We hope to understand how this shell was sourced and used in those two areas. These investigations are funded by the European Research Council as part of the Starting Independent Researcher Programme (Seventh Framework Programme – FP7) and by the Leverhulme Trust as a Research Project Grant. The opinions posted here are however Anne Haour's own! Please log in often, comment and/or subscribe to keep up to date with what's happening.